First taste of cake... not so sure. 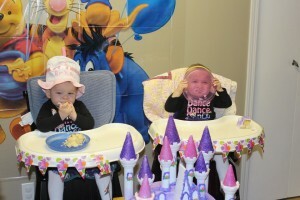 A little over a year ago, two tiny little girls arrived in my life that changed my world forever. In the past year my wife and I have tried to teach them so much: how to eat, sleep, sit up, crawl, walk, and now talk…. but this pales in comparison to what my beautiful daughters have taught me. They have taught me that no matter what is happening in my life outside of the home, nothing is more important than being in our home… being present… being in the moment. They have taught me that a baby’s giggle can turn any moment into a happy one. They have taught me to celebrate the steps in learning in each child; growth happens in each child at different times and in different ways… embrace it. They have taught me to leave and arrive home every day with a huge grin as they “wave” to me in our front window. They have taught me that the mere presence of an infant, let alone two, can strike up happy conversations with random people that would have never occurred without babies being there… and how I need to have more conversations with people whom I sit near in coffee shops. They have taught me that I can survive on a few minutes of sleep per night for many months and still wake up with a smile. They have taught me that curiosity is the root of all learning… and that so many things around us are fascinating. They have taught me that no matter the generation, babies bring joy to those around them. They have taught me there is nothing like the beautiful gaze, gentle touch, warm hug, softly held hand or sloppy fish kiss from an infant. They have taught me to value wellness over everything else.. as what I want for my children above all else is to be healthy and happy. Most of all, they have taught me that life is all about the little moments… to stop and enjoy them because they pass so quickly. A year ago… my world changed. Thank you to my beautiful wife and daughters for all you have taught me and for making this past year the most amazing of my life. Happy birthday to my little monkeys. Thank you to all my friends, family, and staff who have supported our family this past year. Here is a video I made for my family… thanks to Marty Stevens for the song idea. Powerful post, Chris! Being a fellow survivor of a few moments of sleep every night with our two little ‘barn cats’, you do realize that a little smile goes a long way. PS. I notice you didn’t include what your children teach you with respect to tolerating noxious smells or the persistent stain your shirts get on your left shoulder from drool…now THAT’s real learning. Hope you have had a great holiday with your girls! Those are beautiful sentiments your shared and a lovely video. And that song gets me everytime I listen to it. It is amazing how quickly babies learn and grow through their natural curiousity. As a parent of twins, I find myself adapting to one stage and then they scoot onto the next. They are good at keeping me in the moment. Definitely keep this tradition of writing to your girls what you have learned. I write letters to mine on their birthday each year. Brings back nice memories. Thanks for sharing! Marty… thank you for your continued reminders about the moments to enjoy… all the best. Brilliant Chris! As a father of 3 beautiful daughters myself…I’m with ya all the way! Family 1st. All else second. Girl power! Thank you for sharing the lessons learned from your year as a father! The video is awesome! I pray that one day I, too, will have the opportunity to learn from my own child or children. Merry Christmas! Being a father has helped me as an educator… so I look forward to hearing about the time with you as a father in the future! Thanks for chiming in Dwight! ALl the best in 12. Great words, which have truly hit me. My wife and I are expecting our first in June. Well said (written), again. I have always said that the best gifts I ever gave myself were my two children… so now you know!! The best gifts you have given me are my grandchildren. Thank you so much… I love every second I share with them. Being a parent, and now a grandparent, makes life so beautiful. The power of love and being loved! What a gift! Being a parent is truly an amazing gift. Our own children teach us so much more than other people’s children – about our own children AND about our students. I love watching your videos! Your girls are precious! I can’t believe our youngest will be turning 1 in a couple of weeks! Wow Chris! What a beautiful tribute to your two beautiful daughters. Such a powerful post! Thanks for reading and commenting Aviva… here is to another great year! Simply…beautiful. How lucky they are to have such a tribute to them on their first year. Happy Holidays to you and your family. Sorry to have missed this back when you posted it, but I’m so with you on everything in this post. My baby girl is 2.5 now, and she’s changed me in the same ways that your daughters have changed you. Enjoy those late nights while you’ve got them, by the way — and enjoy rocking your girls to sleep. Those are two things that I cherished more than I really knew until Reece was too old for them. PS: We need to get a play date on the calendar with Cale. Now THAT would be a cool way to finally meet y’all in person. Some kind of Daddy-Daughter(s) weekend. A brilliant addition to this… thanks so much for adding the personal touch, Bill.